Top Hat Home Comfort is the exclusive dealer for Gutter Helmet Eaves-Trough Protection in eastern Ontario. Gutter Helmet is a highly effective, subtle looking Eaves-Trough cover that has proven to be durable and reliable even in Ontario’s challenging year-round climate. Top Hat’s Eavestroughing division features the Gutter Helmet system exclusively in Ottawa. Gutter Helmet was the first – and still the best – product on the market for keeping your eavestrough clean and free of debris and blockages, eliminating the need for annual cleanings. In contrast with the many competing products, Gutter Helmet truly works over the long term. 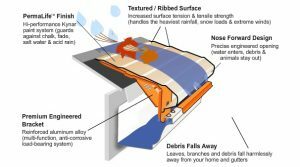 Gutter Helmet is a patented gutter protection system that installs right over your existing eavestrough (or “gutters”). The Gutter Helmet eavestrough protection system keeps leaves, pine needles, samaras (“maple keys”) and other debris out of your gutters, while allowing rainwater to flow freely through your gutters. Gutter Helmet’s secret relies on the principle of surface tension: Water clings to your Gutter Helmet as it flows down the roof, flowing freely into your gutters. Pine needles, leaves, maple keys and other debris, however, fall to the ground below. Your eavestrough gutters stay open and clear, with no work on your part! Keeps your gutters clear from clogs. Ensures that dirt, leaves, needles, maple keys, and debris roll off of your roof and stay out of your gutters. Deters infestation of birds, animals, and insects. Protects your home’s foundation and landscaping by properly directing rainwater away from your home. Protects against harmful mold, mildew and rot caused by water gathering in your gutters and seeping under your fascia and eaves. And perhaps most importantly, Gutter Helmet keeps you off of that ladder because it eliminates the need to clean out your eavestroughs! Protect your home (and yourself!) with Gutter Helmet installed professionally by Top Hat professionals. First, our expert installers clean, seal, check and adjust the alignment of your eavestrough where necessary. Then, we custom-fit your Gutter Helmet to your home with heavy gauge, reinforced support brackets. Gutter Helmet panels are independently prepared and secured over your fullsized gutters. Our installers mount your Gutter Helmet under or over your roof shingles, depending on the construction of your roof, using the industry’s highest quality poly-butyl sealant. After completion and final inspection, we tidy up and restore your home and your property to their original condition. You can rest easy knowing your roof and your roof warranty are safe with Top Hat. For a free estimate, please call 613-722-1226, email: info@tophathomecomfort.com, or fill out our online request form.